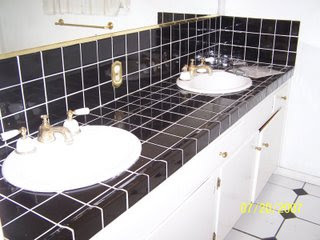 Here is what the kid's bathroom looked like before the remodel began. Four kids, two sinks...it's a good thing- we will for sure put two sinks back in. Four would be optimal, but wouldn't fit. And this is how the room looks like today. Hubby also took out the ceiling, he's going to make it a vaulted ceiling...something our little old vintage house never dreamed of. Hubby is not just handy, he is a visionary too. Well, the whirlpool tub has been ordered, the two sinks and vanities are in the garage..we are at a standstill until the tub gets here and the tile is chosen.